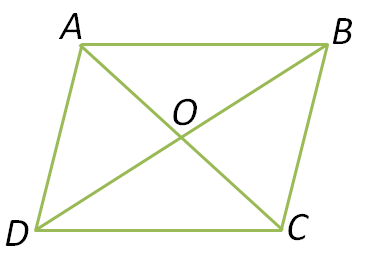 In this post, we show that the diagonals of a parallelogram bisect each other. We will use the fact that the diagonal of a parallelogram is a transversal to the opposite sides of the parallelogram. The transversal and the sides form congruent alternate interior angles. Recall that the alternate interior angles formed by a transversal and parallel lines are congruent. Parallelogram with diagonals and . because they are alternate interior angles of parallel lines that pass through and cut by the transversal (A). because opposite sides of a parallelogram are congruent (S). By ASA Triangle Congruence theorem, . and because corresponding sides of congruent triangles are congruent.